On the hard, Clinton River MI, and waiting the passing of rain, not that rain is a thing to stop one from doing what must be done, but this is a time to sit below and reflect on a life of going to sea and how boats have shaped that life. I think I’ve never seen such a concentration of pleasure boats in my life as up and down the shores of the River Clinton. It seems every inch of the riverbank is devoted to boats in one way or another, mostly moorage. They call them “wells” here, with signs proclaiming “Boat wells starting at $399”. What aren’t in the wells are parked ashore, waiting. My kind of place! Comparisons are useful but never quite accurate. Can I say I’m a sailor compared to Captain Lem? Never! But he does remain my role model. “What would Captain Lem do?” helps me find the right answer. The Captain had a pig and chicken tattooed on his feet. “Well, Tommy, ya see” he said “a pig never drowns and a rooster never falls.” Ok, it worked for him, but for me, I’ve gone to sea one way or another for 45 years yet never felt it necessary to get a tattoo. I will admit that long ago before it became fashionable, when I sailed with The Captain on the Schooner LISTER, I did try to pierce my ear with a sail needle and wear a gold earring,… but it got infected and swelled up so I gave it up PDQ and never tried that again. No, it’s not tattoos and earrings that make a sailor, though they do make it easier to recognize one in a crowd at the airport. Is it rum drunk? No, let me state right here, right now, drunk and sailor are not synonymous. So what is it that separates the seaman, the mariner, form the guy who just happened to have enough money to buy a boat? I have deduced two things. They are sea-miles, lots and lots of sea-miles, and desire. When you have some of one and lots of the other, then it will not matter what you call yourself; seaman, sailor, mariner, fisherman, waterman, boatman or yachtsman. It will not matter the size of vessel or whether the water is fresh or salt, ocean, sea, river or lake. It will not matter whether you are male or female. You will know you are a sailor when in your heart you know you are a sailor. And it is a fine, noble and good thing to be. 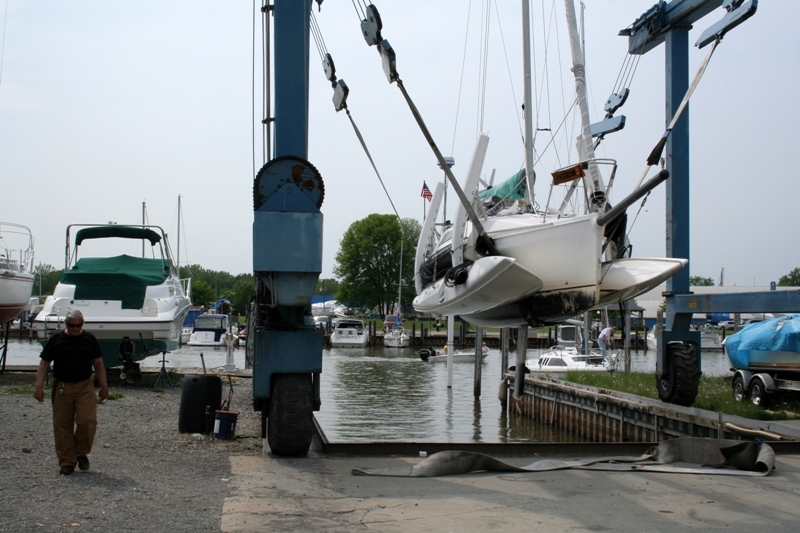 It’s time to put the boat back in the water. A boat without care stops being a boat. A ship without care becomes a derelict. The proud aircraft carrier YORKTOWN ended its days tied to the pier next to my much loved oil recovery ship or ORV SHEARWATER there in Port Angeles. Over several months, I watched as it was cut to bits and pieces and loaded into itself, the hull becoming a hulk, and then it was towed away scrap. Nothing last forever. When THE LADY WASHINGTON was hauled out of the water and gently placed ashore it was said of her, “She’s on the hard” meaning she had been placed on hard ground for the crew to do that work that can only be done in dry air. THE CAP’N LEM is out “on the hard”. This brief respite from travels is anything but restful. I had hoped to raise her with the ammas deployed. The travel lift would accommodate it, but the water well would not, just inches too narrow. The debate ranged from lifting with one amma out to tilting her on her side, but in the end, we just folded her up and set her on the hard. What kind of friends are shipmates? I will tell ya this, with the CAP’N LEM on the hard, it was Tiny and Josh that were underneath scrubbing the slime and sanding to prep for pant. On the fine little Yacht, STORM TREE, it was Tim and Marshel, on AVANTI it was Dave Cullen. To all sailors who read these words, my hope for you is this, to have such friends as would clean your bottom in a time of need. May 21, 2009. The wind has veered just enough to the west to give me progress toward the river. I spend the day coaxing every drop in latitude change out of the wind I can and come to anchor for a while off a beach at Port Huron. I rest, take a shower in the cockpit, watch the mussel boats outdo each other in aimless frantic burst of noise and wake. The CAP’N LEM is fast under sail and dreadfully slow under motor. As the sun drops so does the wind and off we go down the St. Clair River under the international bridge. On both sides of the river Canadian and American flags are hoisted side by side in salute to friendship and free trade. I love going to Canada. Some of my best cruises have been in Canadian waters. Living in a border town as I do, I always take visitors to Victoria, BC. I’m not quite ready to cross the borders, though. I still have to dress the CAP’N …for the ladies, of course. The thought takes me back to the last days spent with Captain Lem. The strongest man I ever knew had become weak so I took on the solemn and awesome privilege to be his final care giver. The VA doctor told me he would die in my motor home. I just said “I don’t care” then to Captain Lem sitting there in his wheelchair, ” What do you want to do, Cap, go into the hospital or keep on traveling?” He looked up and said “Uh, I… I want to keep on traveling!” and that’s just what we did, oxygen bottles, wheelchairs, Depends and all. We traveled by land together that last month, up and down the ICW to visit old time friends, always telling them, “The Cap and I, we’re on our way to Alaska. Cap has never sailed to Alaska. 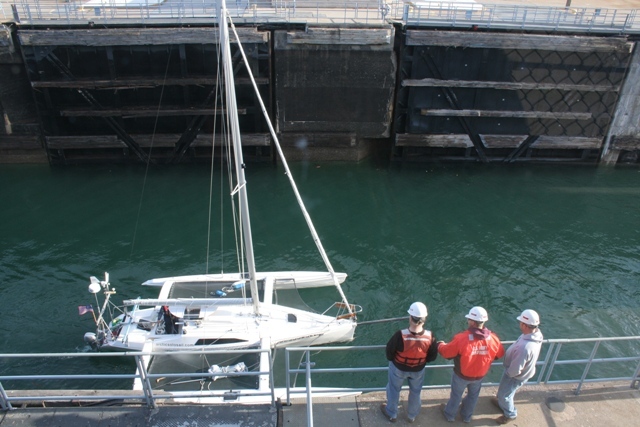 We’re on our way to get the AVANTI and sail there,” But it was not to be. At his youngest daughter’s home in Michigan, we stopped. “We’ll rest here, Cap, just ‘till you feel better, then off to Alaska!” In the end, even that idea had lost its ability to brighten his eyes, but he remained handsome to the last, with dignity and grace befitting a hero who had helped save the world. I would set him up in his bed, wash his wrinkled face and hands, and gently comb that beautiful long white hair and beard, telling him all the while “Oh Cap, the ladies want to come in for a visit. We have to get ready…for the ladies.” His daughter and granddaughters would then be allowed in to read to him or sing him songs. He always managed a few words of charm, especially when the nurse was along. They were our days of remembrance. “Cap, remember time Riley Davis, Donna and you and me…, remember Burt and Catherine, remember old Henry …” His last day, we rang a little ships bell eight times, the watch was done and all was well. He wore out, and stopped, like a clock not wound. So now I take care of his namesake, THE CAPTAIN LEMUEL R BRIGMAN III, the little boat on its way. But first a stop for new bottom paint, a good bath and some re-stowing of the gear, and the all important placing of the name and a christening. A southwest wind sends a string of waves behind the CAP’N LEM. The shallow water stacks them up out of proportion to the strength of the wind. We run with them with a burst of speed but it’s a losing race. They lift the stern, give a burst of speed then pull back as they roll on setting us up for the next one. By angling this way and that, I can catch the bigger ones trying to squeeze another foot or two toward the east but with a following sea the waves always out run the boat. Rounding the Port Austin Reef Lighthouse, I think of the Lightkeepers from the past willfully imprisoned on this manmade rock island. Who were they? What did they do when they weren’t trimming wicks, oiling lamps or polishing lenses? Did they read…a lot? Were there more than one? Ashore with a house and quarters perhaps they were a family but out here? It looks so small and so far away. Did the weight of responsibility set heavy on their shoulders awake and asleep, “must keep the lamp lit. Must not go dark”. In 1966 I joined the Coast Guard with dreams and fantasies of perhaps I’ll be a “lighthouse keeper” but that era was passing and it was not to be. Knowing what I know now it’s just as well. I loved and hated the ships simultaneously. Loved the sea, hated the seasickness. Loved the adventure, longed to be home. What a quandary! The wind wraps around the headland with us for awhile then quickly leaves us in a confused water to be hit with a headwind. We tack, short and long, short and long. The short tacks take me in close to shore where the land warps the wind and veers it to the southwest giving us the lift we need to make south until it backs again and we tack. The day is getting old. Several short tacks and we’re inside Harbor Beach breakwater and anchored. The sun rises and the wind rises. This lake does not want the CAP’N LEM to leave none too quickly. I lose track of tacks, but the short/long works again. A day of labor and I make Port Sanilac. Inside the harbor the wind is still gusty. No docking in this so to anchor I go. But it drags, catches, drags again. I watch it with suspicion until it lets go altogether. Quick, start the motor, set the autopilot, forward to haul the anchor before running over the line with the propeller. The anchor is just a ball of grass from the bottom. No wonder it couldn’t bite and hold. New spot. Wonderful, stinky, sticky, softie mud. Got to love mud! Mud holds. Anchored at Lat 43° 25.816’N ~ Long 082° 32.210’W in 5 feet of water having traveled 1107 nm to date. Tomorrow more of the same, but Friday! A change. There is a plan behind my meandering port to port through the lakes and not looking for shortcuts. I’ve gone through waterways, lots of waterways and I love them. They are always interesting to me, but it’s out on the lakes that I learn those things I need to know about the boat. Remember, until I sailed from Two Harbors in April, I had only been under sail in the CAP’N once for the sea trials before buying her. That was for just a couple of hours in very light airs. This is my learning time. 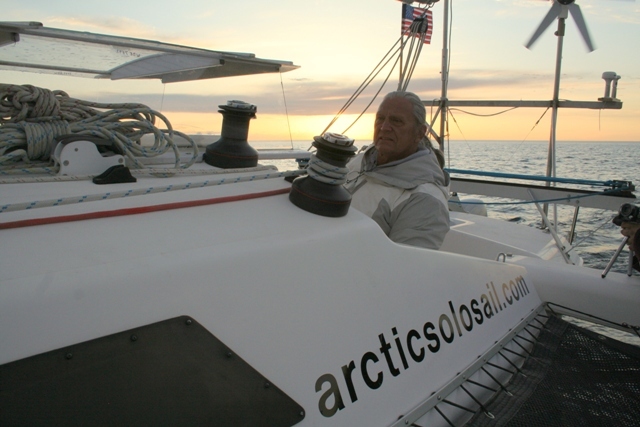 Learning the boat, how to sail alone, how to sail a multihull, learning how to be alone without being lonely. My learning style is repetition. And there are the milestones that encourage, too. There were two this leg. The first occurred when I crossed Latitude 45° at Longitude 083° 22.738N heading south. At that moment I was exactly half way between the equator and the North Pole heading the wrong direction or so it may seem. This serves to remind me, on the oceans of the world the shortest distance between two points is never a straight line, but a Great Circle. 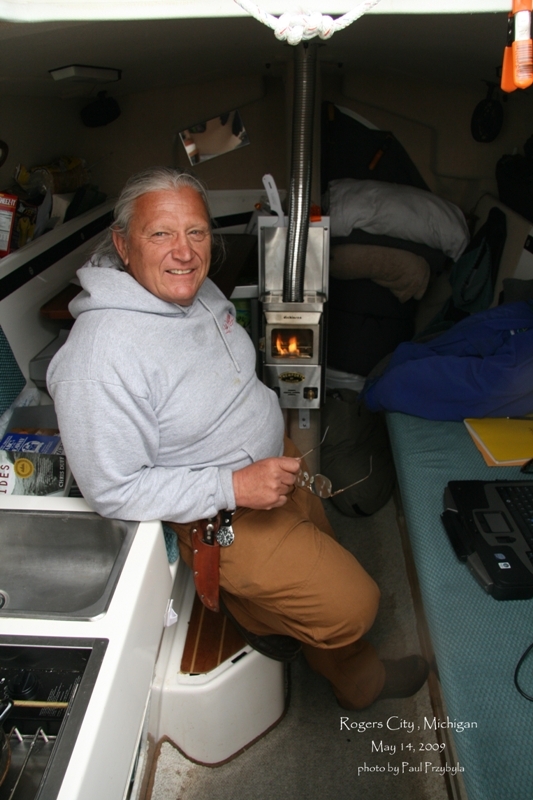 Then, while sailing from Oscoda to Port Austin, at 1423 position Lat 44° 13.455’N ~ Long 083° 03.339’W, THE CAP’N LEM sailed her 1000th nautical mile since launching in Two Harbors MN on April 6th 2009. This reminds me to never live in dread of how far I have to go but joy at how far I have come! And my dear friend, in life, as in sailing, I have come a very, very long ways. I encountered headwind leaving Rogers City to make my way south. Tack, tack and tack again. I don’t make enough headway to be called progress so back to Rogers City to wait out the easterly gale. This gives opportunity to meet more interesting and delightful people, the mayor, the Chamber Pres, a reporter and a really good photographor who brought me a picture of the CAP’N LEM taken from the air when anchored out just off the harbor. There was a time my dream was to sail across an ocean. I may yet do that, but for now with each place I stop and the people I meet I’m more and more convinced this is the right trip for the time. They fortify me for what is to come. One lady asked me how I would deal with loneliness as I go farther north. Maybe it’s because I don’t feel lonely now that I haven’t foreseen that to be a problem. When I’m on the water by myself I just don’t feel alone. To be on the water is a confirmation of my connectedness to so many many people. Nameless to me, faceless to me. They built the boat, canned the clam chowder, baked the Cheezets, wrote the weather report and on and on. Each contributing even if as unaware of me and my dreams as I am of them and theirs, yet connected we are. From this I’m drawing a deeper feeling of respect and awe at those who I do not know, yet, they have contributed so much to my happiness and wellbeing. Without even questioning their motives, I just accept their help and move on in the wind. So by maintaining such an attitude loneliness cannot possibly overtake me. That and of course, you’re with me. The waves are different on the lake. There is a subtlety I’m not sure of but I know they are different. Perhaps it’s the density difference from salt to freshwater. I remember having to learn to calculate the difference in the draft of a 750 foot ship loaded on a freshwater river and its draft once it hit the seawater when I was testing for my licenses. (Not a small undertaking for an old cowboy who barely made it through high school). Maybe that accounts for the short period of the waves in relation to their heights. I wouldn’t attribute it to just shallowness of the lakes. For one, they are not shallow and two, the contours are similar to many found in bays and sounds of the Pacific Northwest. In any case they do seem to be very short of period. Besides, CAP’N LEM loves sliding down the face of them like a California suffer boy. I can hear his chuckle in the wake. The CAP and I sail on into the dark before deciding to head for Alpena. I’ve never seen so many marked wrecks on a chart in such a small area. The wind backs to the north to accommodate us then dies to a wimpy 5 knots. I meet one Laker coming out the channel. My late night crosses his early morning. It’s 0400 on the 15th before we’re moored at Lat. 45° 03.539’N ~ Lon. 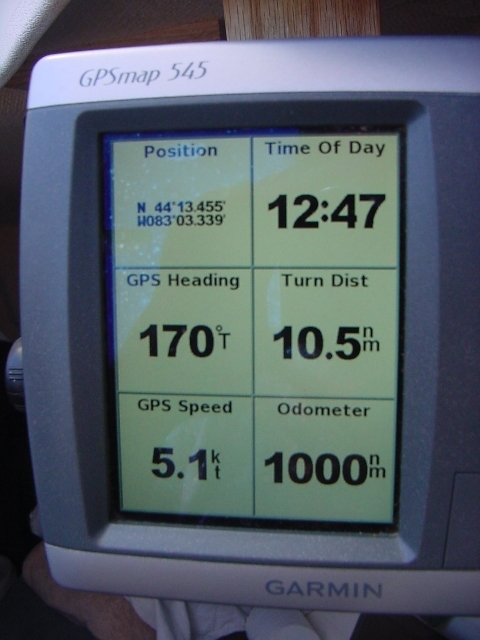 083° 25.624’W having traveled 85 nm to day, and 939 nm to date. Thank you for wishing me “good luck”. I understand that you have wished for me good things and success in my venture and that it is kind and well meant. But I must tell you this. I do not believe in “luck”. Of course, a bold statement like that demands an explanation. You see, “Luck” is merely a word contrived to sell me lotto tickets and get me to the casino or to allow me to explain away another’s hard work, “he’s sure lucky”. So what do I believe in if it is not “my good luck” to be living my dream on the waterways of the world? I believe in the consequences of my choices and action. I’ve not always thought this deeply about the reasons things happen the way they happen. Being on a small vessel on big waters waiting a storm to pass is a good venue for such reflections. Perhaps it helps to reach 63 years still alive, many times in spite of my choices. And it helps to take a constant inventory of my past in search of what not to do. I don’t always know what to do next, but I’m rich in the knowledge of what not to do. This search reveals me as an emotion based decision maker in desperate need of becoming a principle based decision maker. I see clearly those moments I made snap decisions that altered the course of my life forever. Every bad decision ever I made felt like a good idea at the time. The cold light of the truth shows me it was mostly my laziness that urged me to choose if it feels good, do it; if it feels bad or is hard or even uncomfortable, don’t. (A bad philosophy to live by in any book.) But I got smarter. I reserve always my God given right to get smarter. So for me, there is a trap in believing in luck. It’s this; it will always desert me when I need it most. Only hindsight would reveal wither Luck was with me or against me. The greatest lie a person can tell himself, “That’s just the way I am” as if being one way is our unchangeable destiny. A lie! Of all God’s creatures only the human being is granted the power to change moment by moment to whatever he chooses. The eagle is and always will be an eagle doing eaglelie things and the rabbit a rabbit doing rabbitie things, only we in the confines of our puny little bodies with the oversized and underused brain can choose to act in accordance with emotions or with principles to alter that destiny. To trust in luck is to through that choice back in the face of the Creator who gave it. So as the wind howls and the boat rocks hard against the seawall in Rogers City MI, am I “lucky” to be here and not out there? No, I choose to be here, based on these principles. 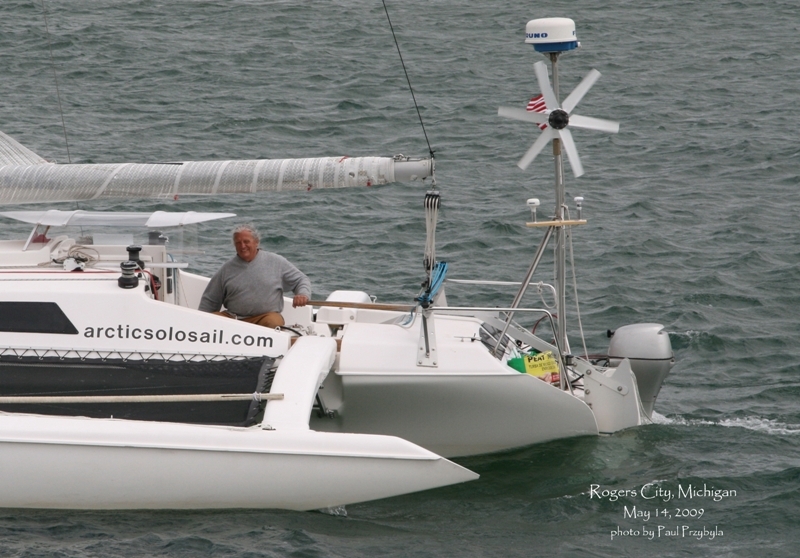 A small trimaran will make very little headway into the wind. There was a long way to go to the next safe harbor. The wind will change. 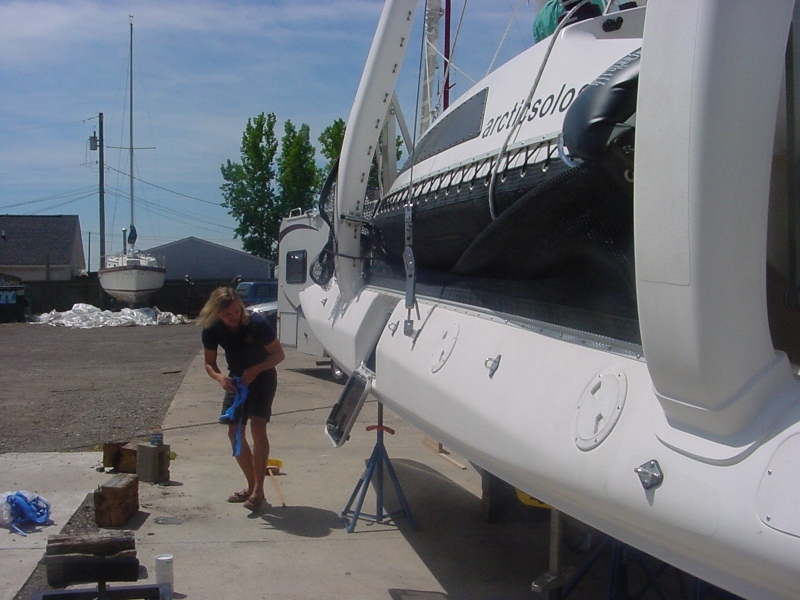 A small trimaran will make great headway with the wind abeam or just abaft the beam. If I go out into a storm trying to make head way chances are I might break something. Chance and luck are not the same things, though they are always used as if they were. The casino entices me with “come try your luck” when they know that the mathematical probability, the chance, is with them. I ask myself, how else did they afford to build that beautiful hotel. Please don’t take this as a judgment on your particular choice of entertainment, you’ll miss the point. “What’s the point?” The point is… I say these things for my own edification. Sailors are students of nature and what better subject than my own human nature as it relates to the choices before me. Robert Frost reminds me “good fences make good neighbors” which remind me good principles make good decisions. I waited and the wind changed. Please wish for me a clear mind, sound body and good choices based in the principles of good seamanship. 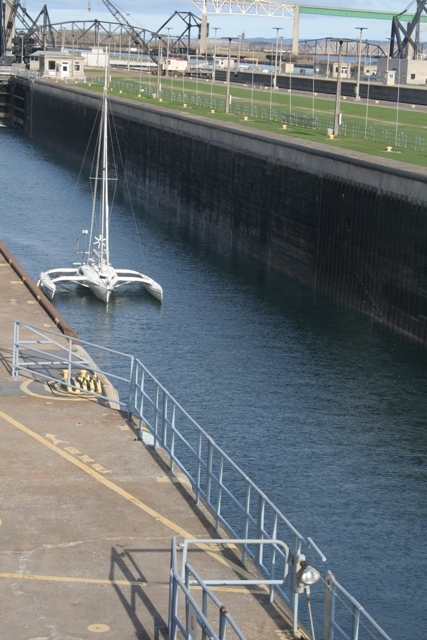 May 9th, 2009 0600 underway from my shallow water anchorage for the American Locks at Sault St. Marie, MI. Yesterdays wind was just too strong to attempt a downwind landing in a new situation. The lock attendant passed me one line and down we went, all that water just to drop me 21 feet to the level of the next lake. Well, better than shooting the rapids. May 10th, 2009. 1130 underway for Mackinaw MI with a nice down river wind. The river, St. Mary’s, is interesting and fun to navigate. There are lots of islands, coves, marshes and waterfowl. Not wanting to spend another night in a town, I anchor in a large shallow cove above DeTour, MI. at Lat. 46° 06.102’N ~ Long. 084° 03.551’in 9 feet of water having traveled 818 nm to date. The wind is stout and strums her music in the rigging, CAP’N dances. I enjoy the seclusion of this place, feeling warm and secure down below. The sunset is clear and promising of good weather for my first venture into Lake Huron. 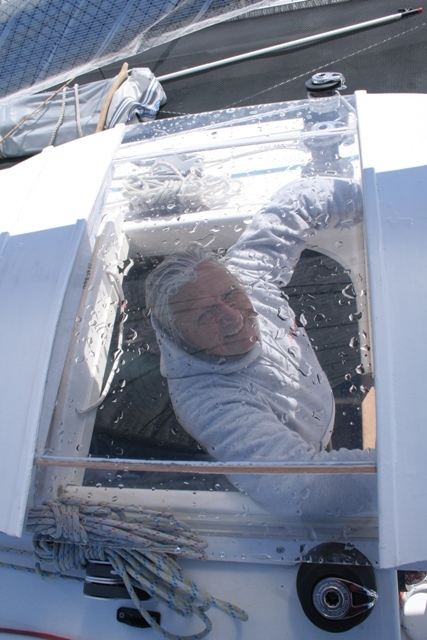 May 11th, 2009 I raise the main to a ¾ reef in anticipation of the wind on the lake, then sail out the anchor getting underway for Lake Huron. The morning ages with the passing landscape and I come abeam of De Tour Lighthouse to starboard. The open lake brings a change in the wind and with it, a change in destinations. The west wind is a good decision maker. It blows away my desire to brag about sailing all the big lakes, so I save Lake Michigan for another time or another life. 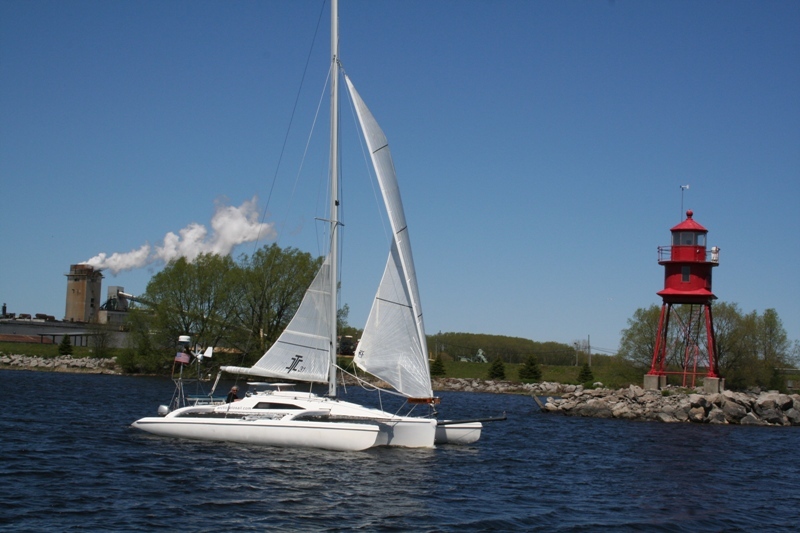 I confess it was only an ego thing anyway to go so far to sail under the Mackinaw Bridge then turn around to come back for the sake of saying I had sail Lake Michigan. The wind knows me better than I know myself. I set the sail for a broad reach then look to where that will take me. Rogers City. He must have been a fine fellow, this Roger, to own a whole city in name, like this. I shake out the reef and raise the mainsail full. 10 knots of wind put a “bone in the teeth” of the CAP’N LEM and we clip along at a steady 7 knots over the bottom most of the afternoon. The warmth of the day tires the wind and we’re left with a glassy sea and only 2.5 knots. The good CAP’N can find some wind even when Tommy can’t. I’m met by a friendly gentleman on the dock, a fellow boat owner, offering advice on where to tie and assistance with the lines. I fight of the urge to say “no, I’ll handle it,” remembering it is good to feel useful to a stranger and so many have helped me this far. I’m blessed to be washed in such good will. I approach the dock slowly and ask him to take the bow line. Moored now, we chat a bit. He points out his boat, a nice new twin outboard. We talk of whither and whence. I do pass on his offer of a ride,though. I need the walk. And the walk is good. No place in particular, up past the City Hall, the Police Station, the Dollar Store, the bank and back. Roger keeps his city very tidy, very tidy indeed. No trash in the streets, the park is clean and well kept, even an outdoor theater for summer music. I like this place but I’ll be moving out to anchor anyway. Outside the breakwater, I anchor in 12’ of water on a rocky muddy bottom, (the bottom is clearly visible at Lat. 45° 25318N ~ Long 083° 48.501W having traveled 46 nm to day, and 864 nm to date. You are currently browsing the archives for the Lake Huron category.